This dish tripod mount is the perfect option for situations when permanent mounting is not desirable. The pole and legs attach to base but can be easily removed for storage and portability. 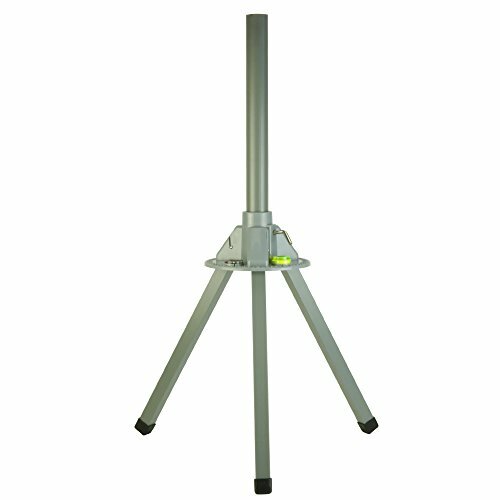 It stands 3 feet tall, and a 1.66" OD mast is included for quick installation. Additionally, it features a heavy-duty, molded ABS base with convenient azimuth degree markings molded in, as well as a bubble level and compass so you can calibrate the position of your dish/antenna for the best reception. It works with small portable antennas or standard 18-inch satellite antennas and mounts. Great for RV's and campers! Portable design for temporary dish mounting | Ideal for RV's & Campers!